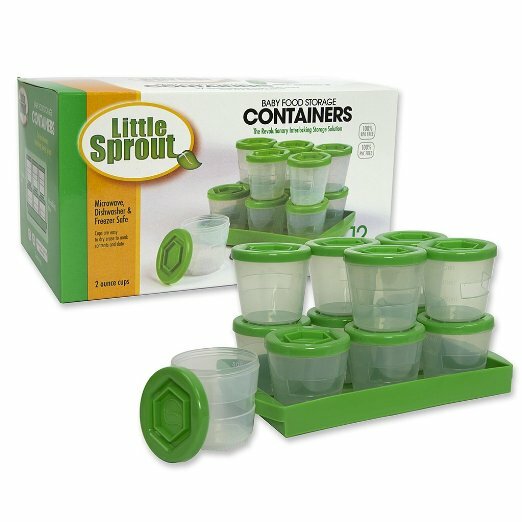 Baby Food Containers by Little Sprout: Reusable Stackable Storage Cups with Tray and Dry-erase Marker – 100% BPA Free New & Improved: Sprout Cups are perfect for busy moms and dads. These 2 ounce cups allow you to make your own baby food and freeze them for easy meal prep later on. Measurement markings clearly show portions and the dry erase window allows you to note the contents and date. Sprout Cups are freezer, microwave, and dishwasher safe for easy cleanup. Screw on lids prevent messes from leaking food. The stacking cups and storage tray provide convenient storage. Most importantly, Sprout Cups are BPA free and safe for baby. I feel that these containers are great for when I am making different dishes for my daughter to try. I love that I am able to use them in the microwave if I need to heat something. They come in the perfect size so that I am able to make my own baby food in small portions. This entry was posted in 2015 Holiday Gift Guide, Reviews and tagged #2015BabyShowerGiftGuide, #2015holidaygiftguide, #holidaygiftguide, #holidaygiftideas, ABC Kids EXPO, babies, Baby, baby food, baby foods, baby gift, baby shower, baby shower gift, food containers, food storage, little sprouts, reusable containers. Bookmark the permalink.